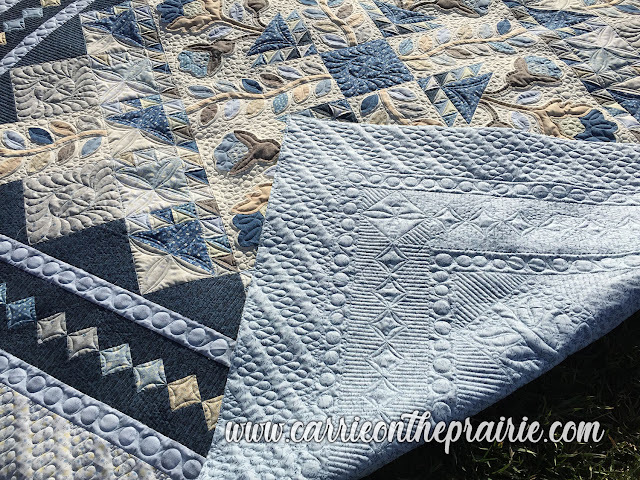 This is another batting-free quilt. 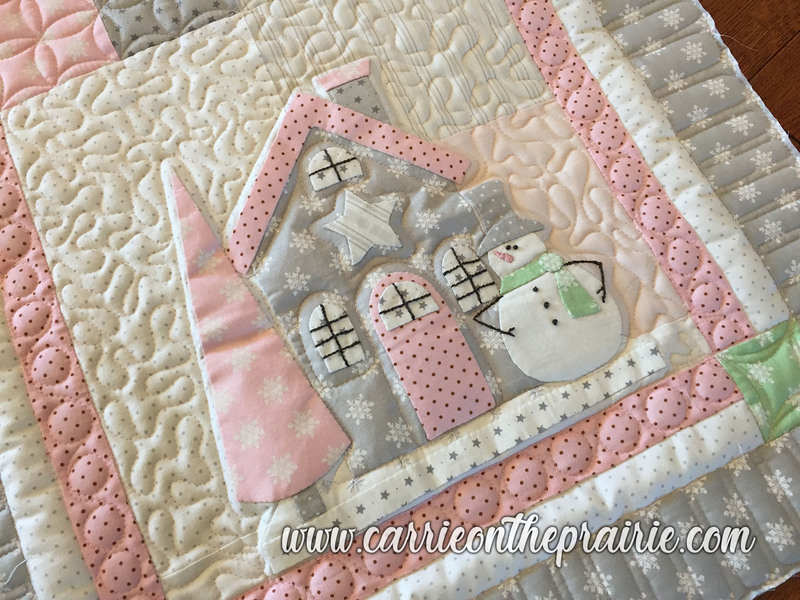 Cuddly, drapey, and wonderful. 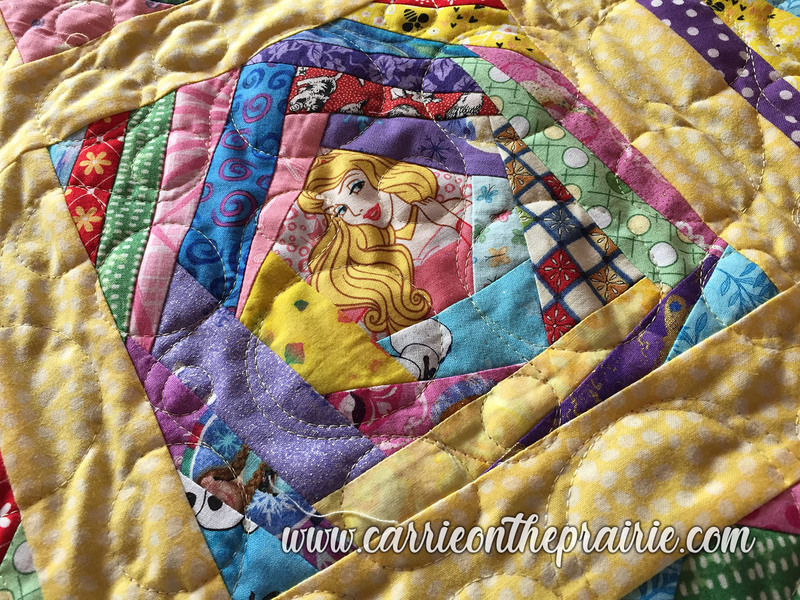 This time it's for a little girl who loves princess. 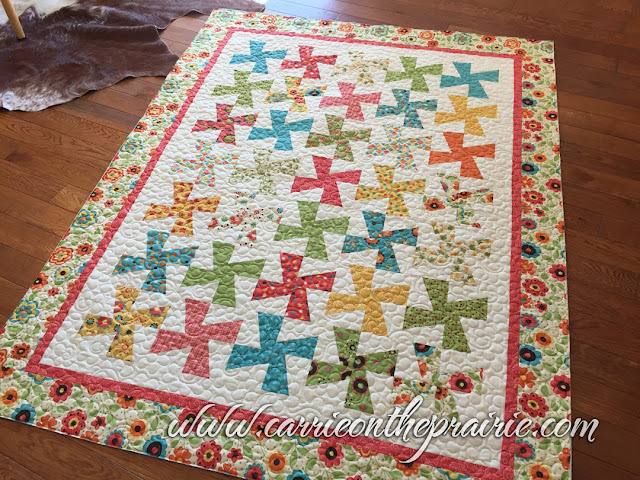 My own little girls just went nuts over it! 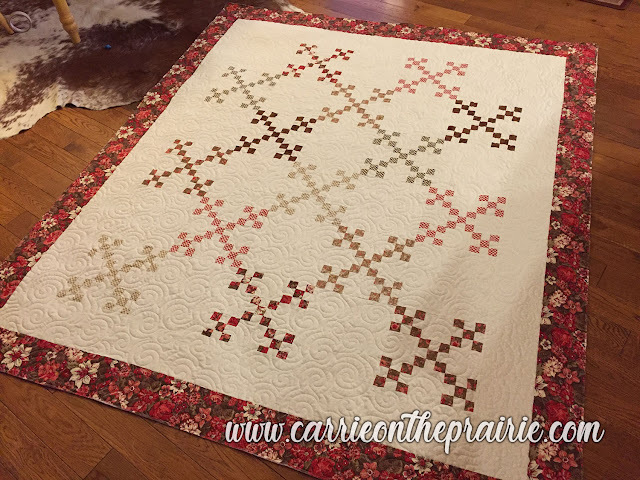 Isn't this an absolutely precious interpretation of a Christmas quilt set? Not your typical red, green, and gold. 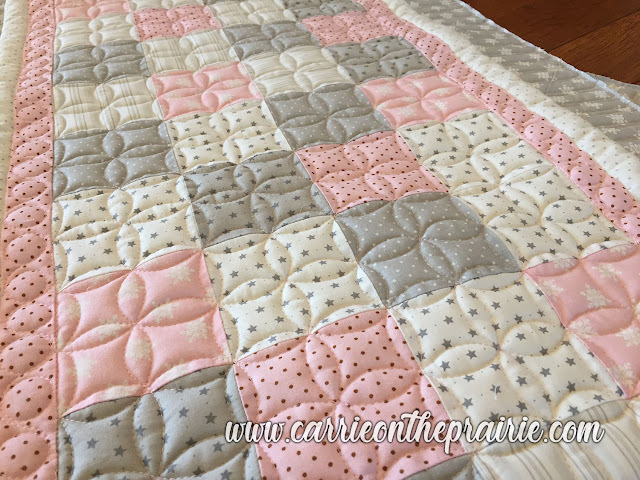 It's fresh and sweet and subtle. This table runner and quilt are totally adorable and were super-fun for me to work on! I love this Block-of-the-Month quilt (pattern by Nancy Rink). 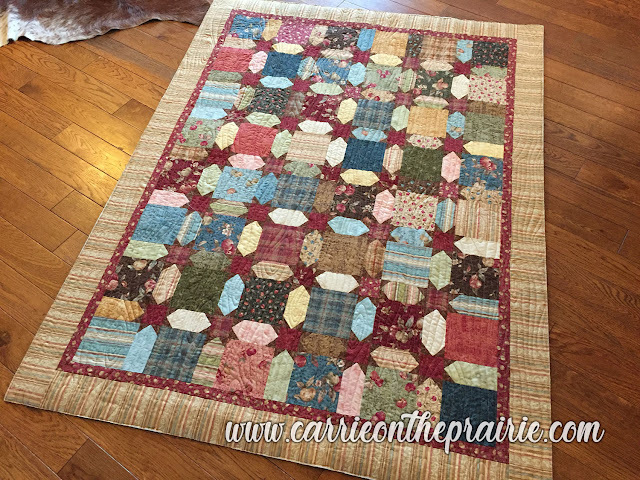 It's so classy and elegant, but still homey and rustic. 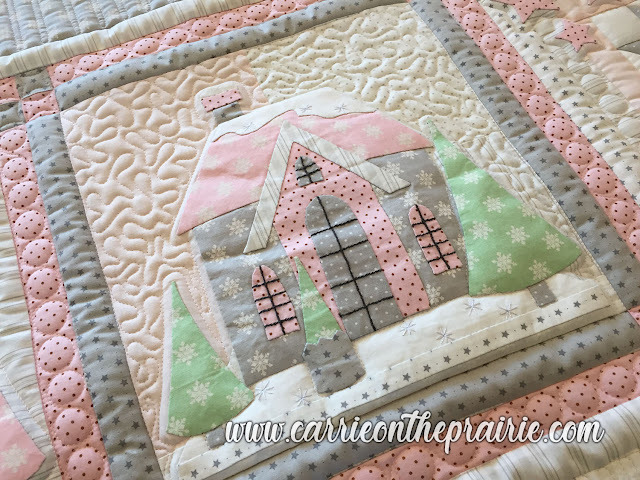 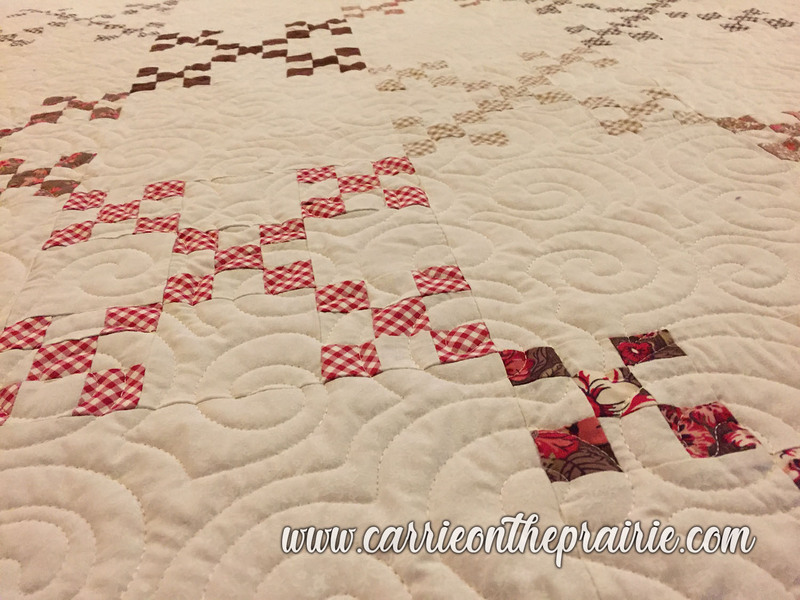 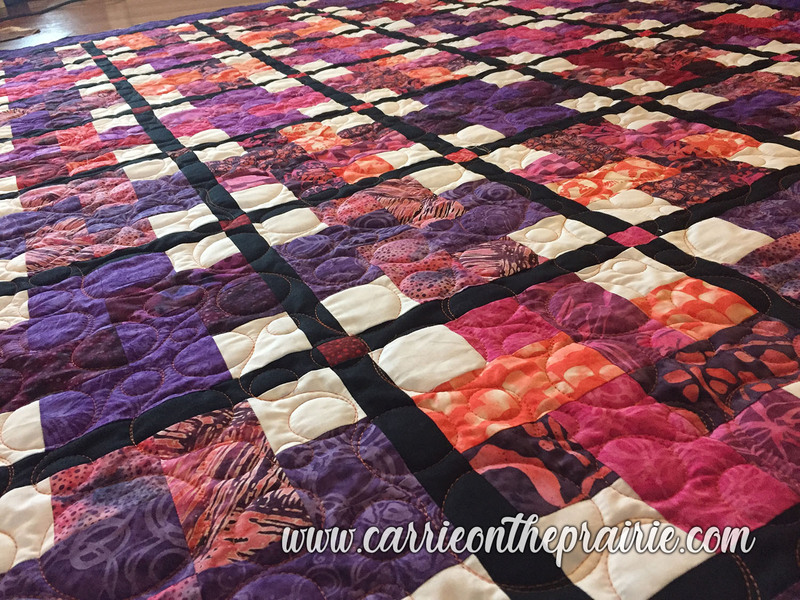 I had so much fun putting a lot of different quilting ideas to work in this custom job. 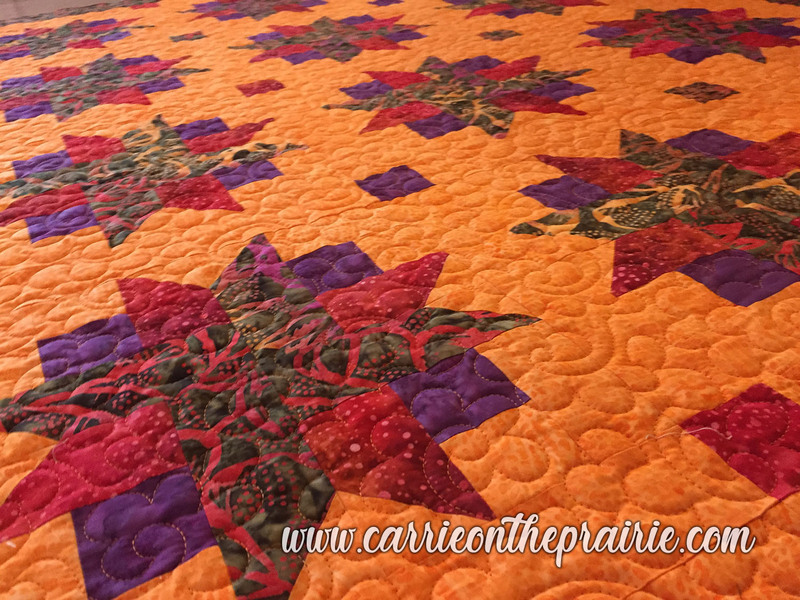 Each different area of the quilt got its own treatment. 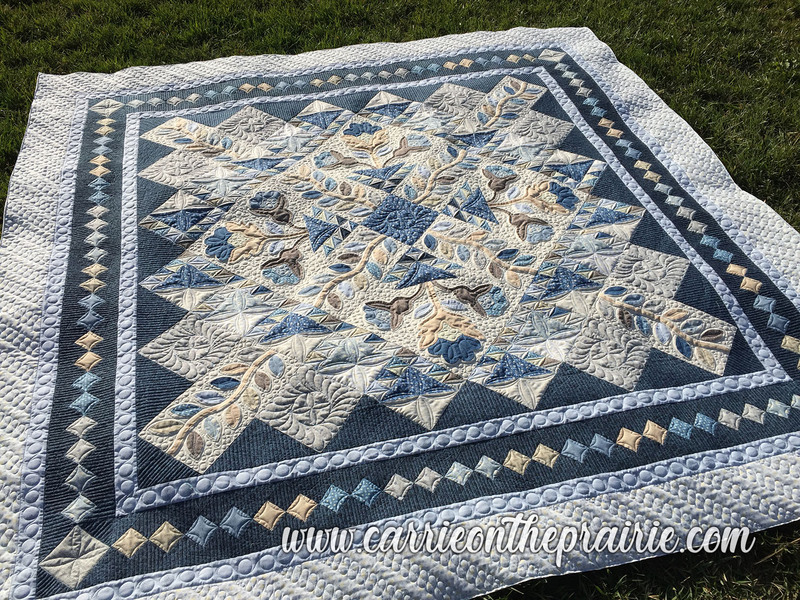 And a big thanks to Pat for trusting me with this beautifully executed project! 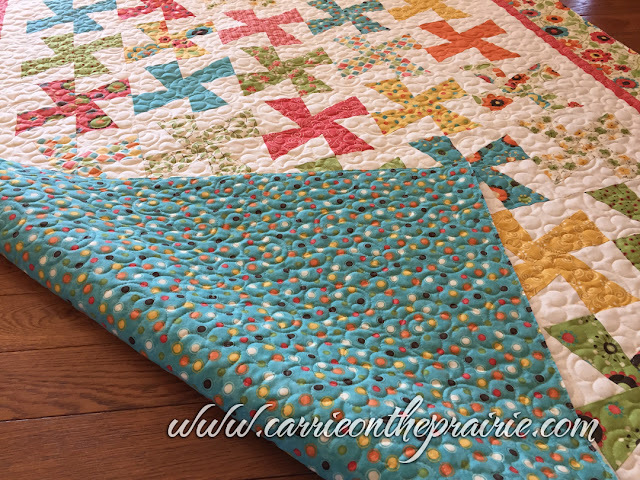 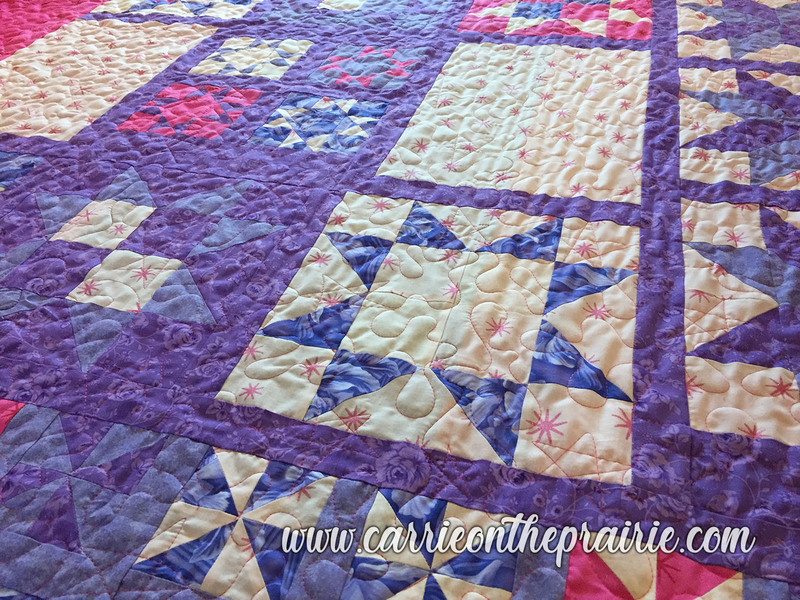 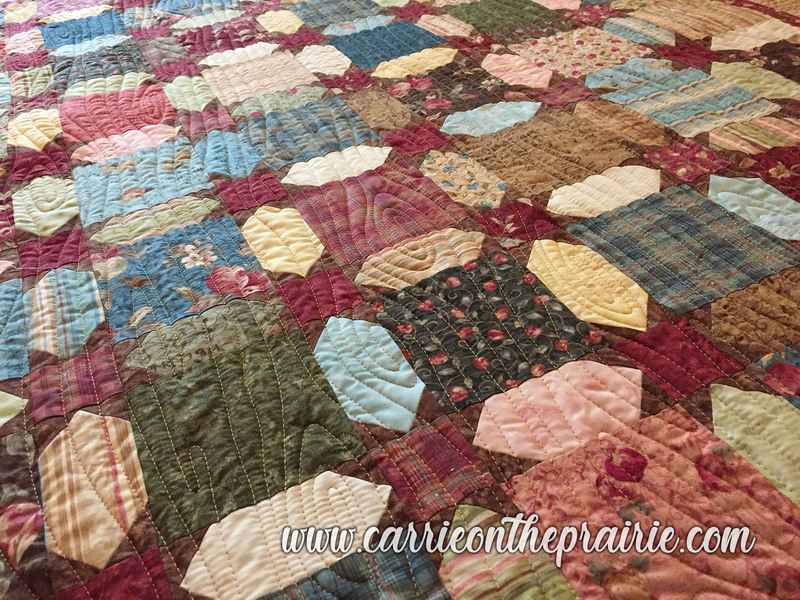 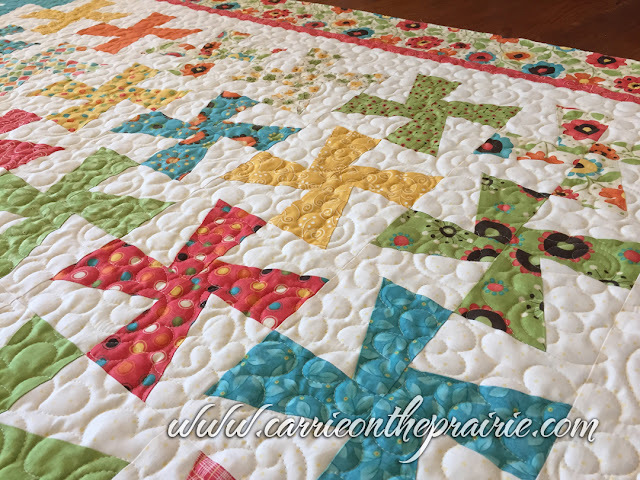 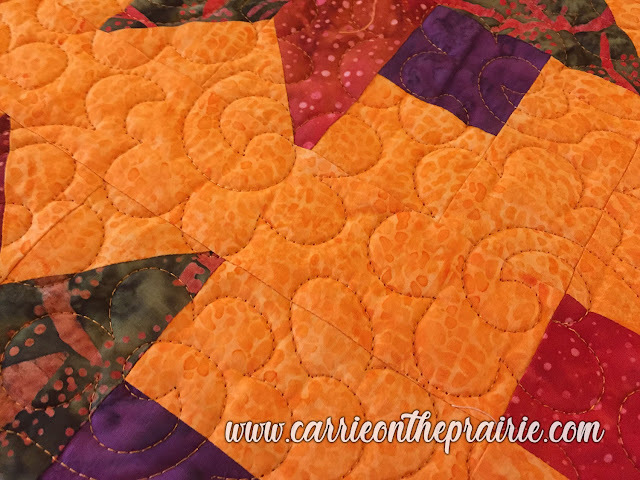 I love the cheerful colors of this sorta wonky pinwheel quilt. 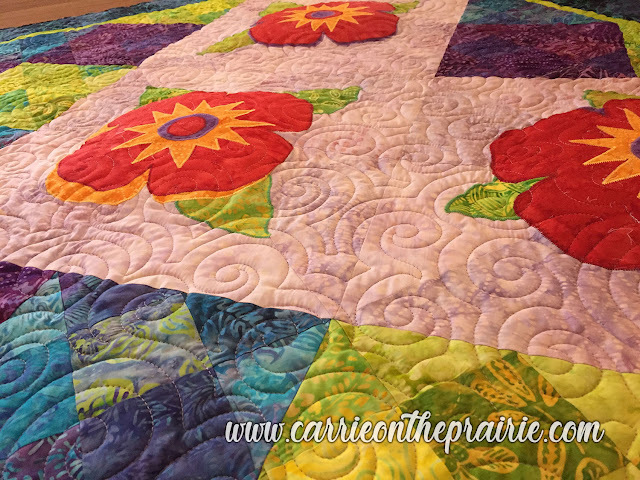 It's youthful, vibrant, and fun. 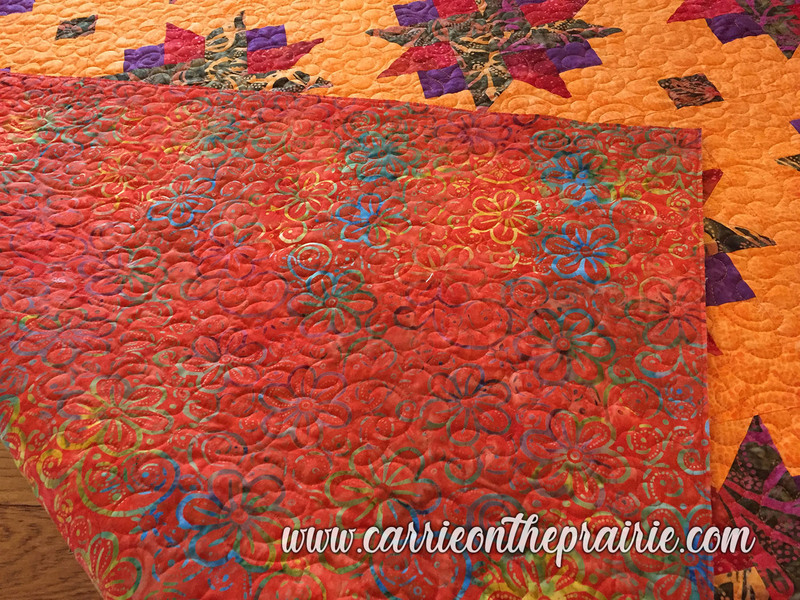 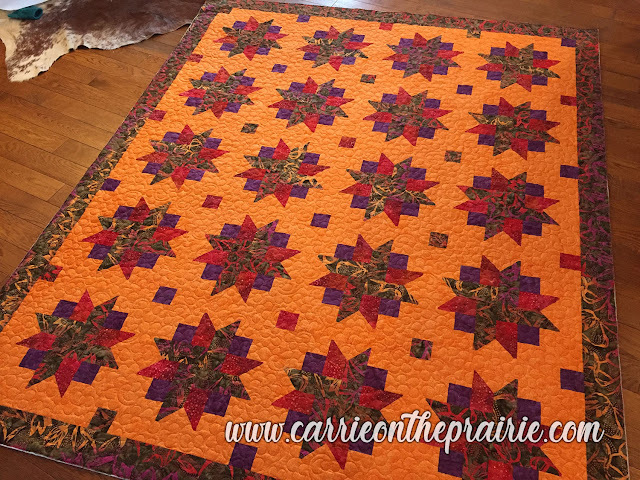 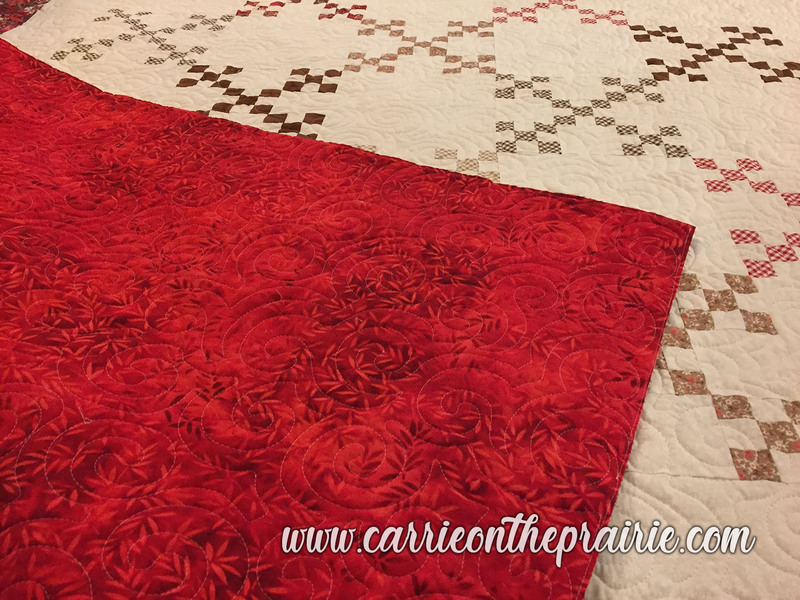 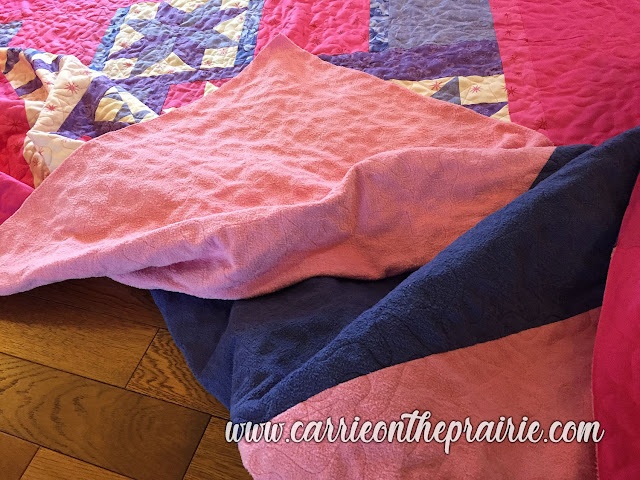 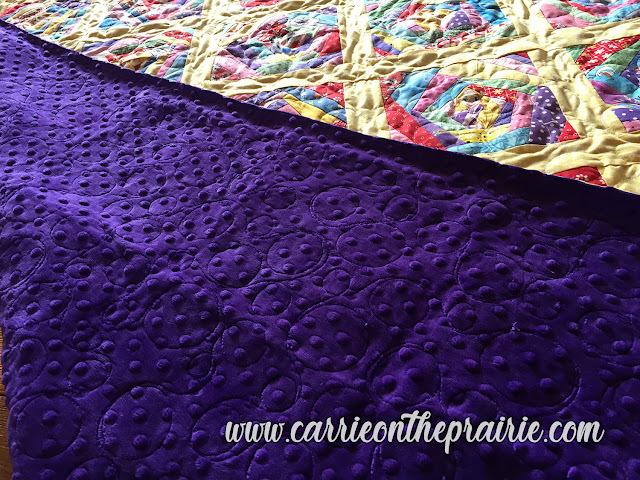 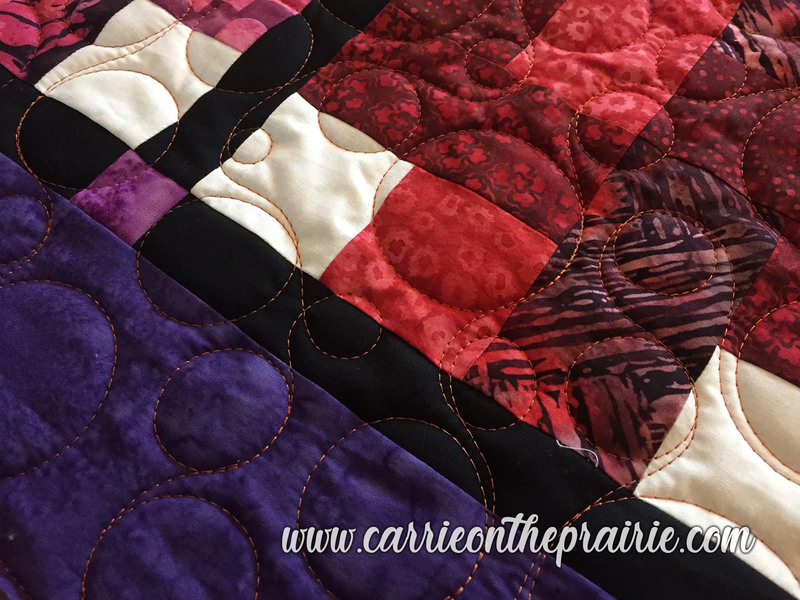 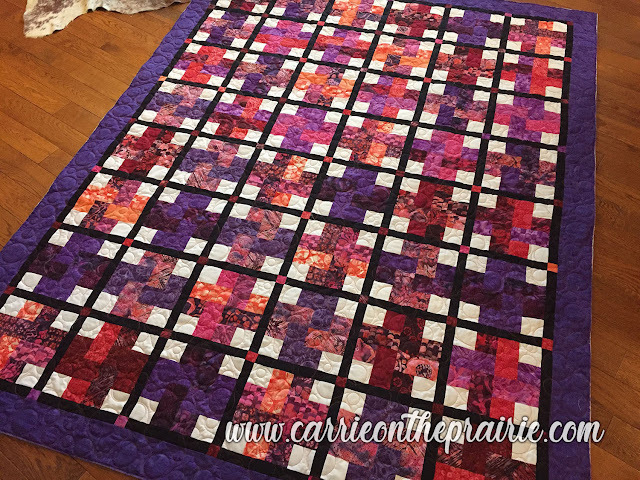 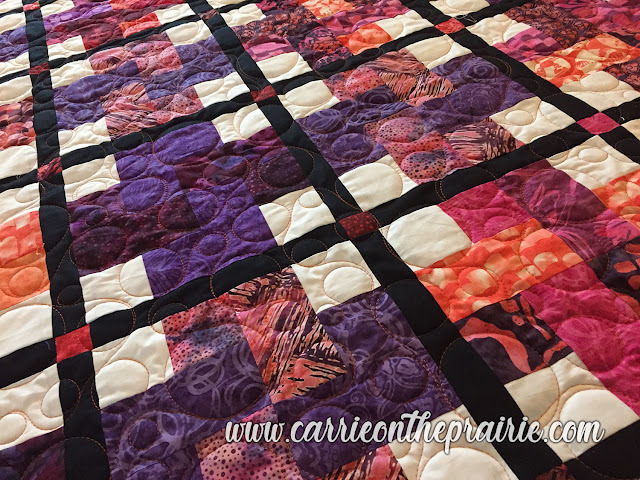 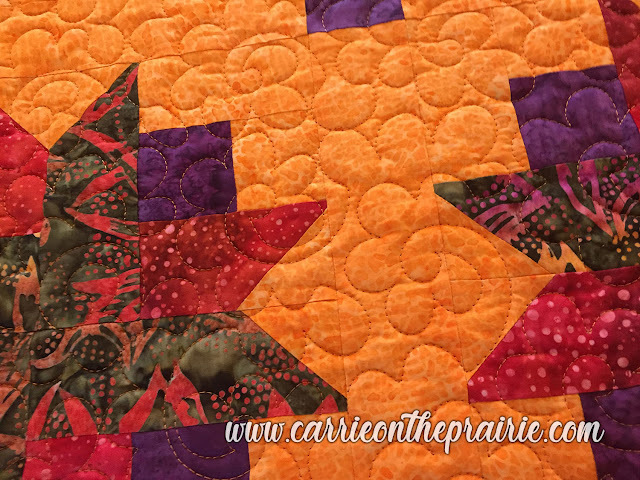 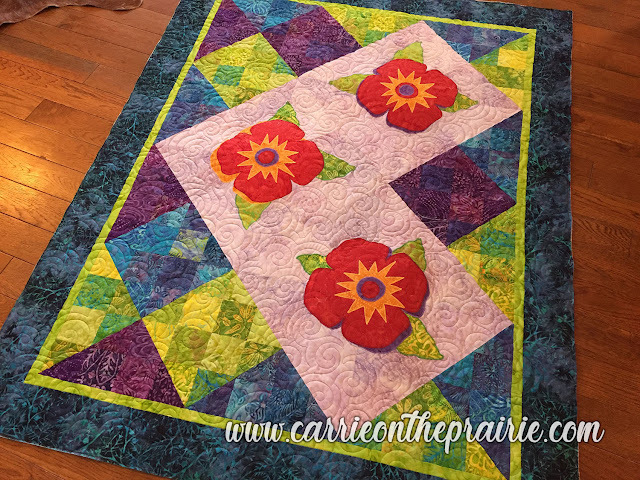 So when Wendy asked me to apply whatever I wanted in an edge-to-edge quilting treatment, I decided to, likewise, pick something vibrant and fun. 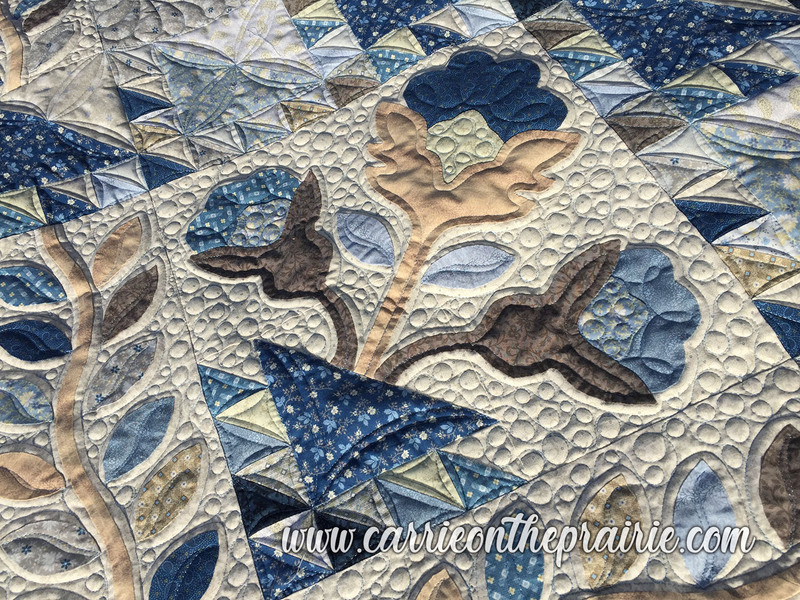 This is my version of peonies. 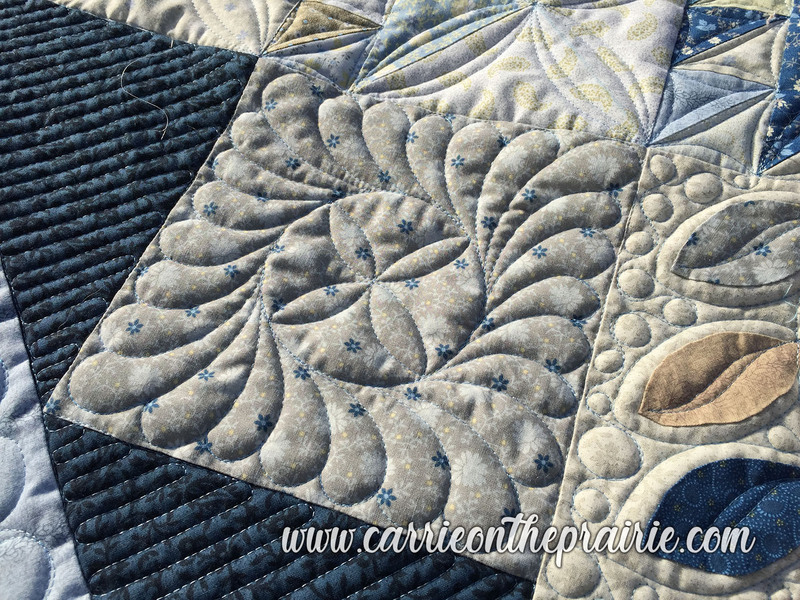 The pedals of these concentric flowers create yummy texture. I think the result is super-cute! 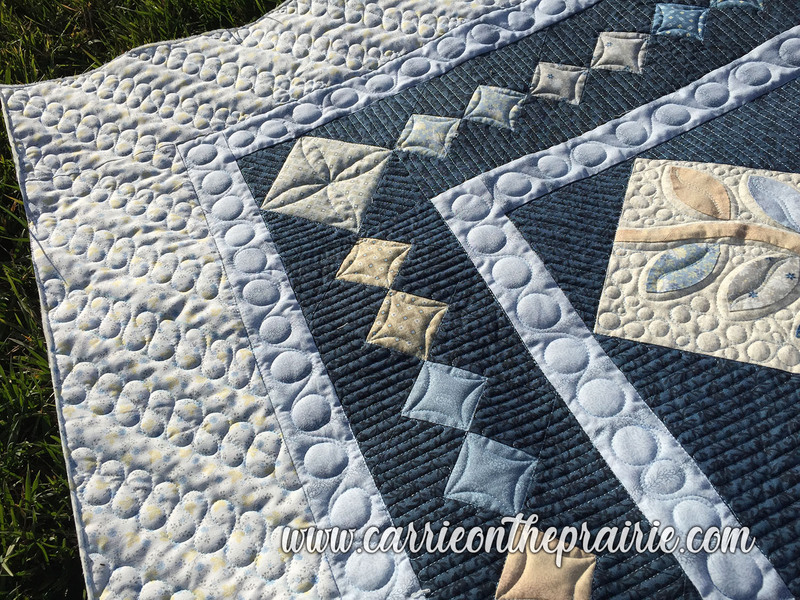 Look at all those tiny, little 9-patch blocks that Barb stitched together! 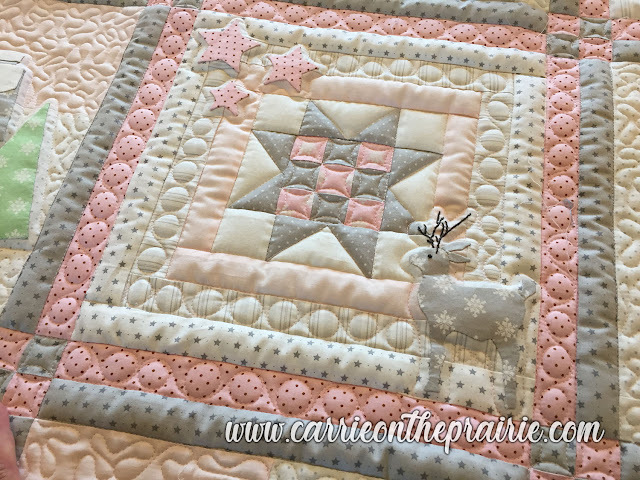 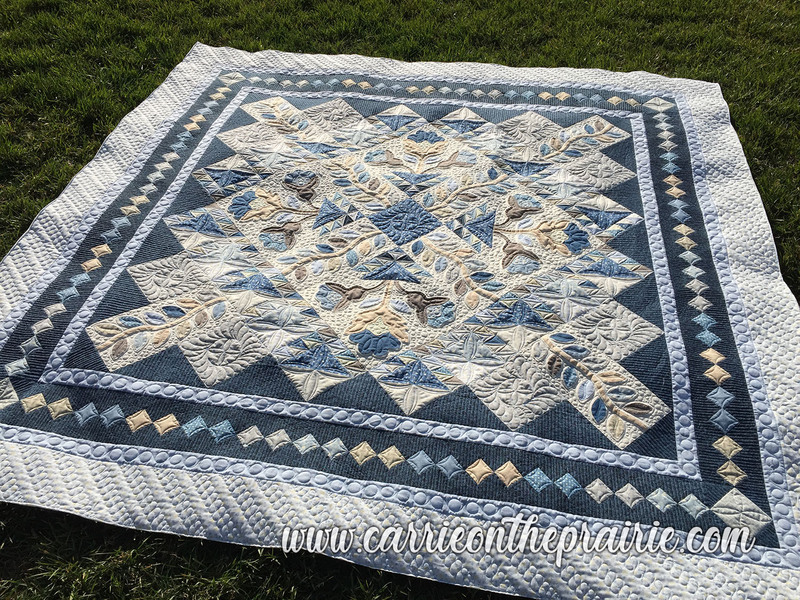 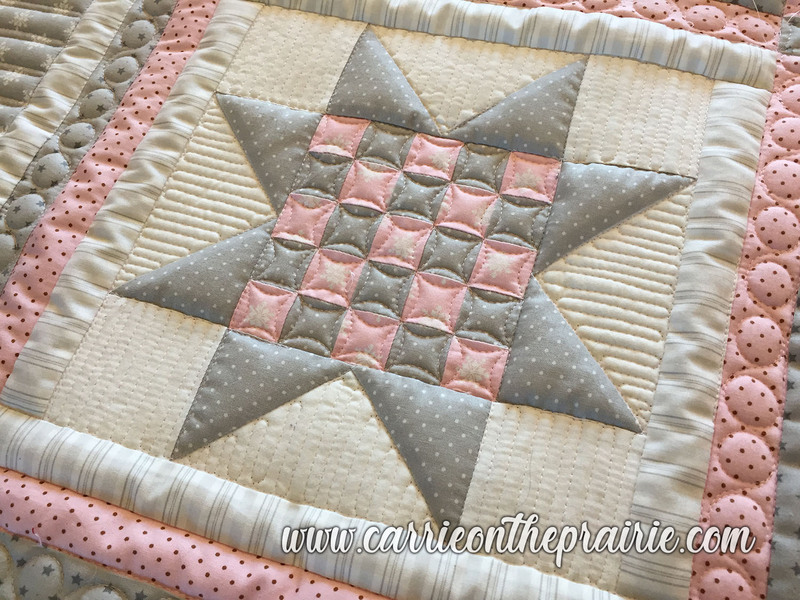 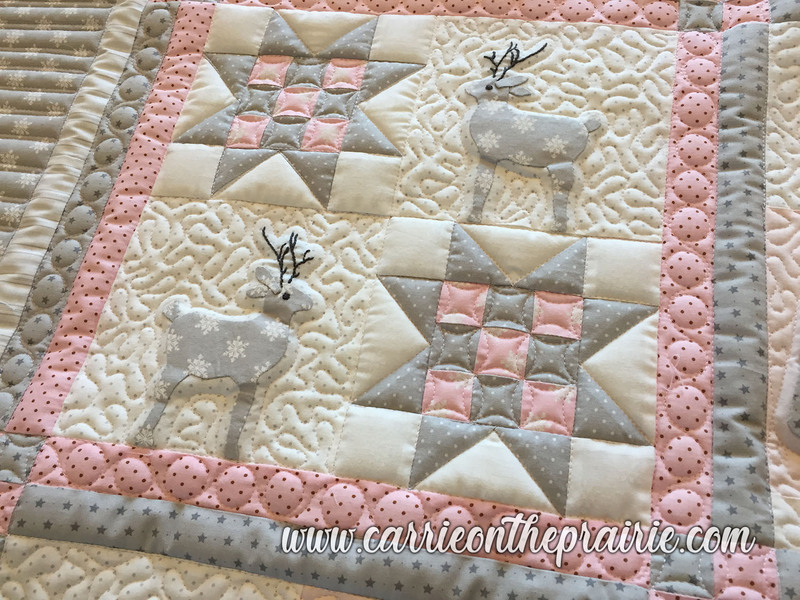 This is a very traditional quilt block, but arranged in double-9-patches like this, with extra white space surrounding, it's a very fresh and fun look. 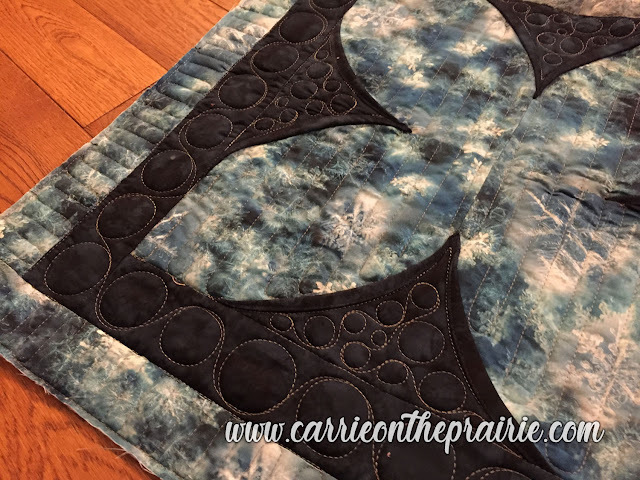 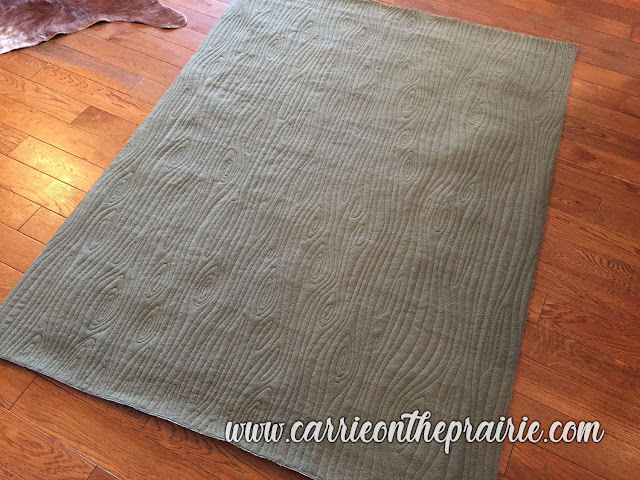 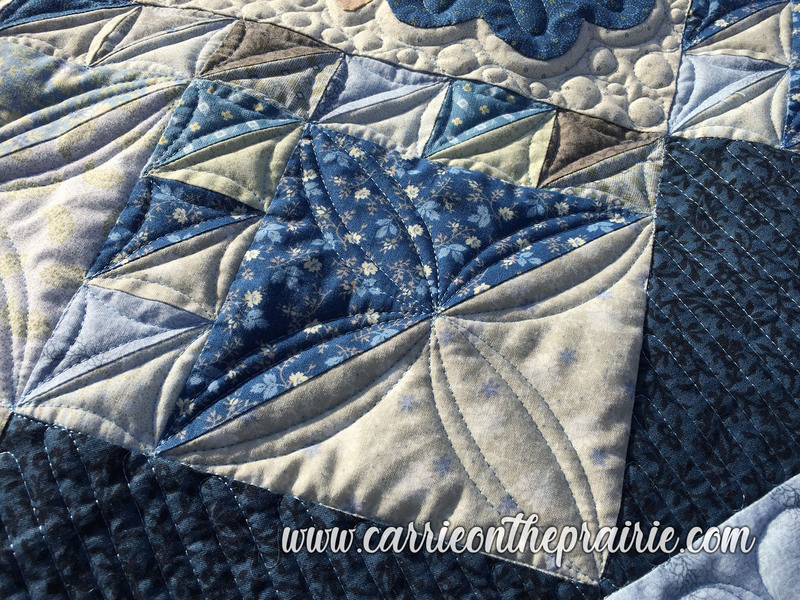 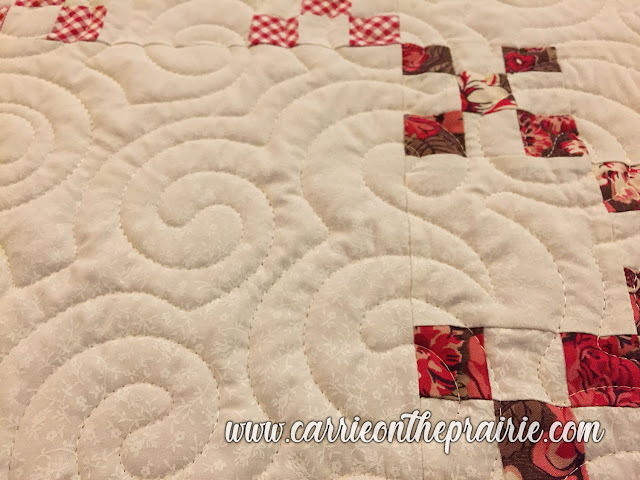 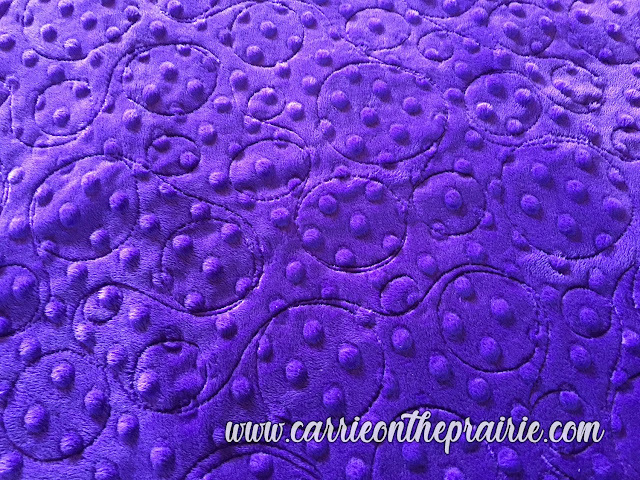 I enjoyed quilting edge-to-edge swirls on this piece. 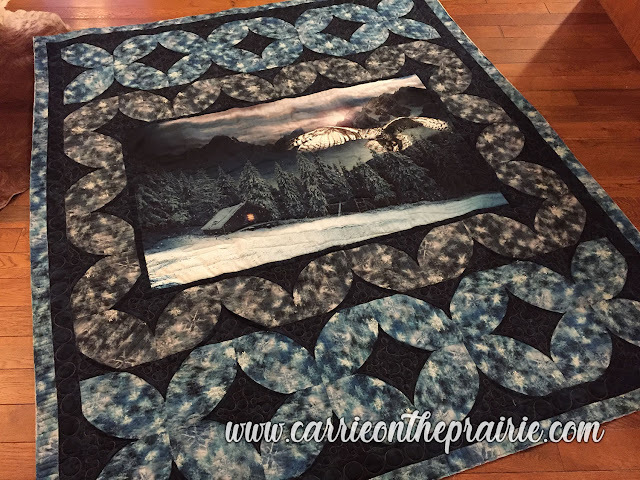 Great job, Barb! 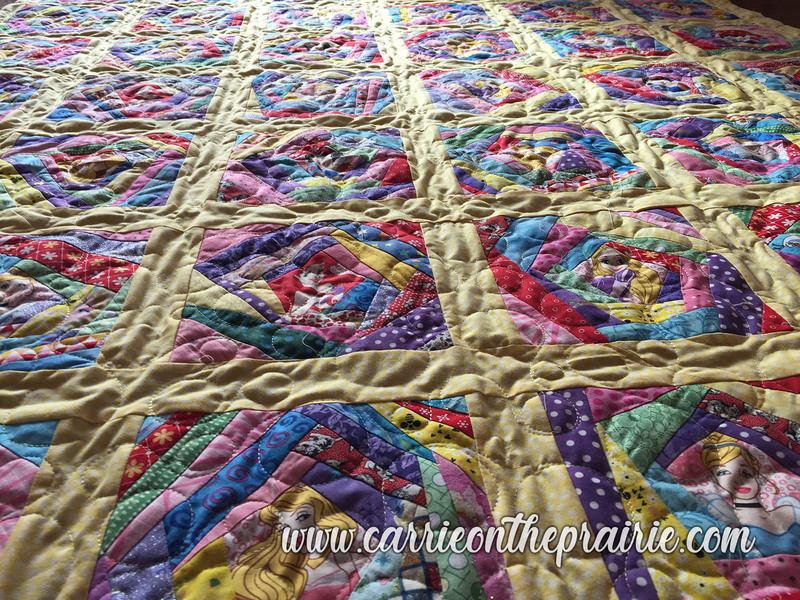 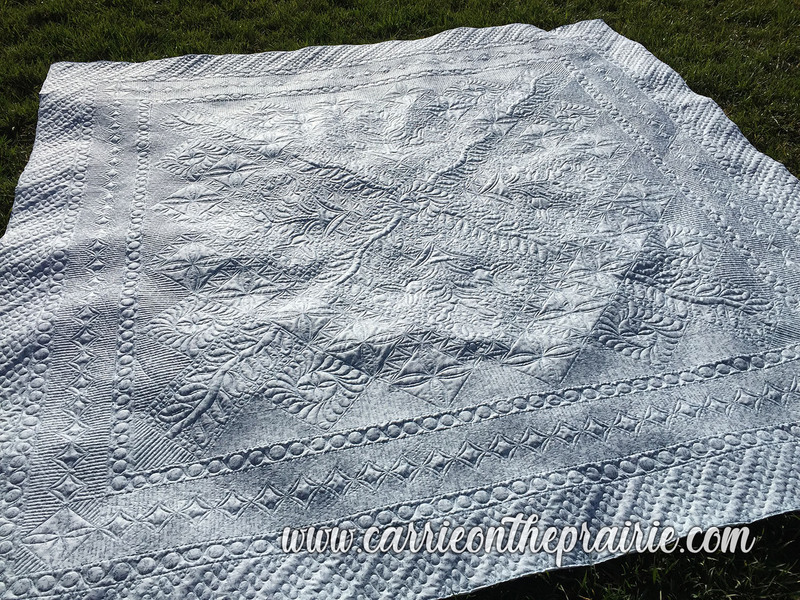 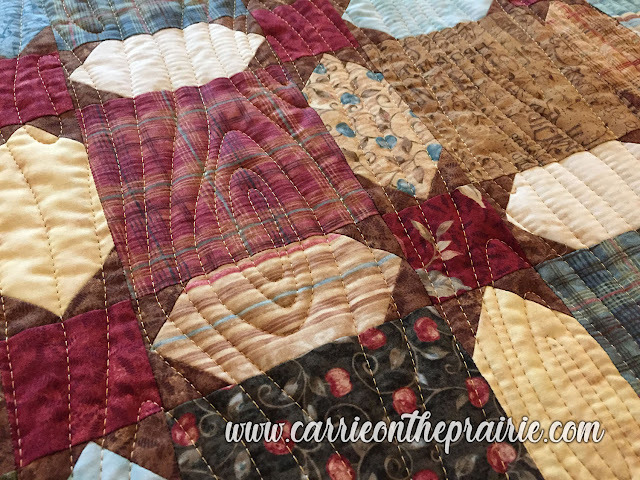 Here's a quilt from Brenda in Okotoks. 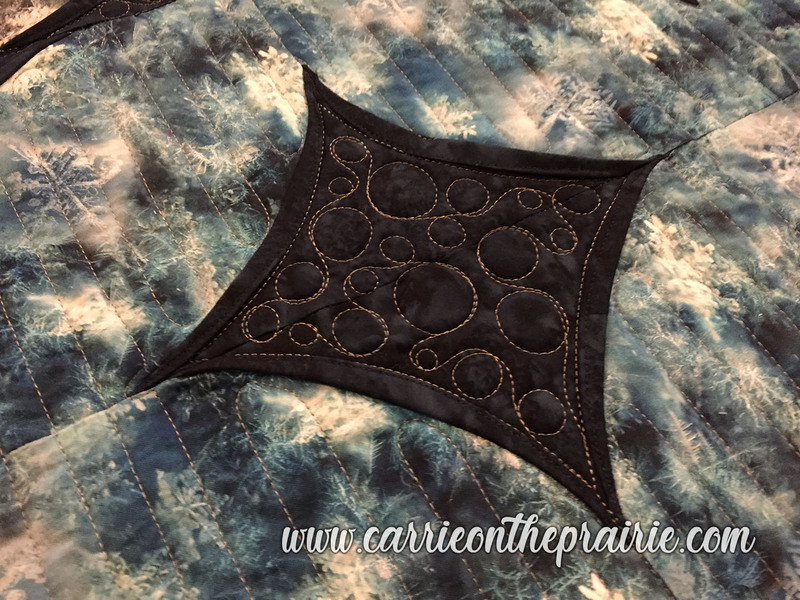 The backing was a yummy fireside-type fabric - fuzzy, warm, thick. 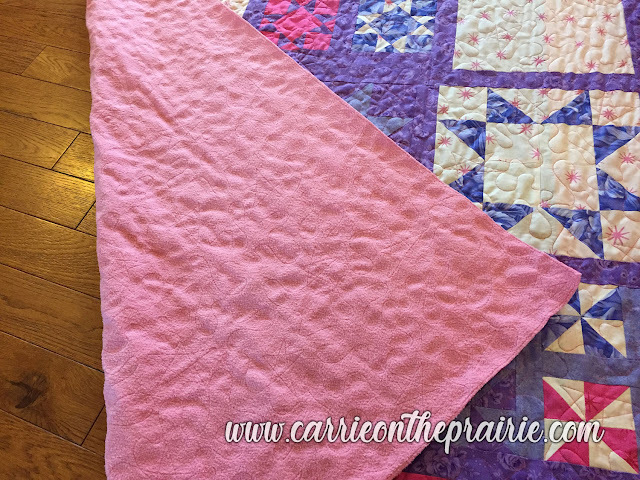 After talking about how she wanted the quilt to be used, I suggested that we experiment with using NO batting. 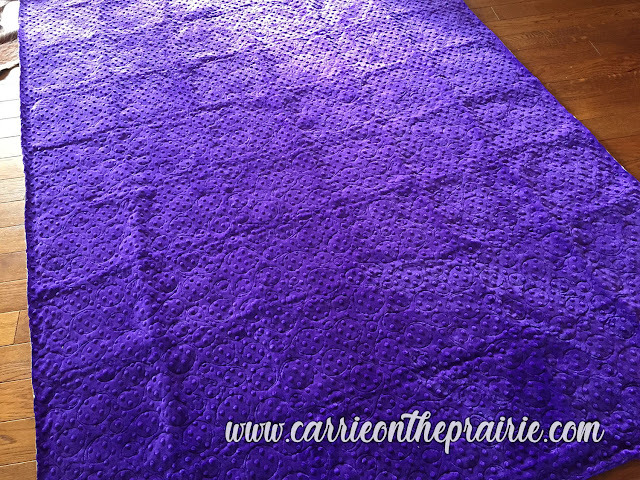 I've done this a few times in the past, and it can have a really neat effect. 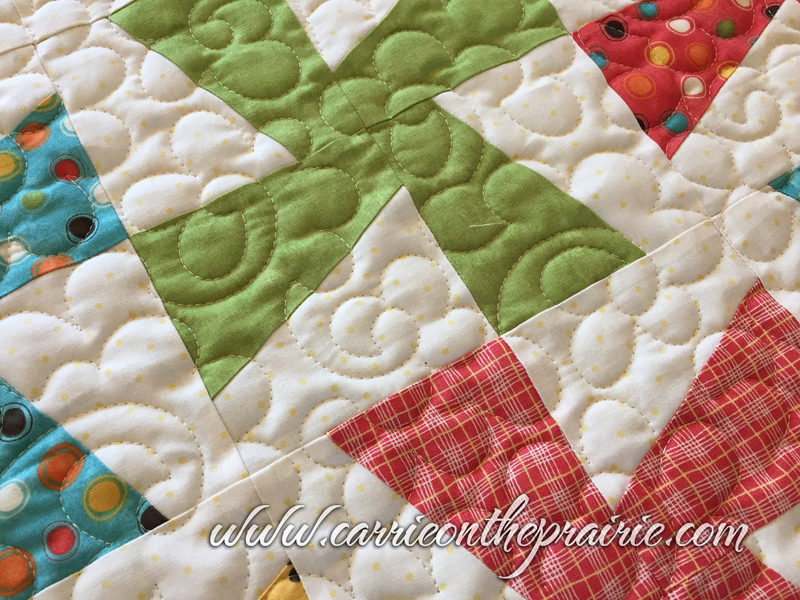 A quilt without batting is thinner, of course. But it doesn't have any body or stiffness. It is really snugly, limp, and drapey and wraps around you lovingly. 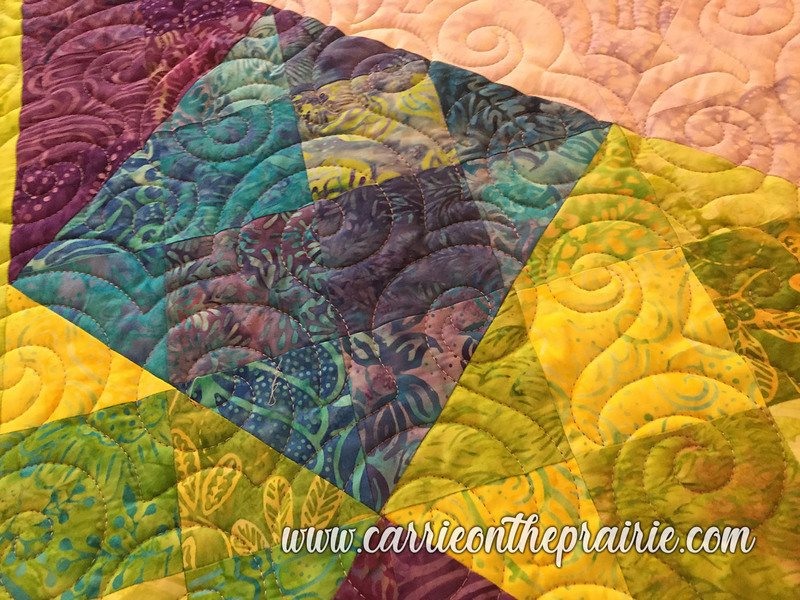 I love the colors in this piece from Joy. Earthtones are totally in my wheelhouse. 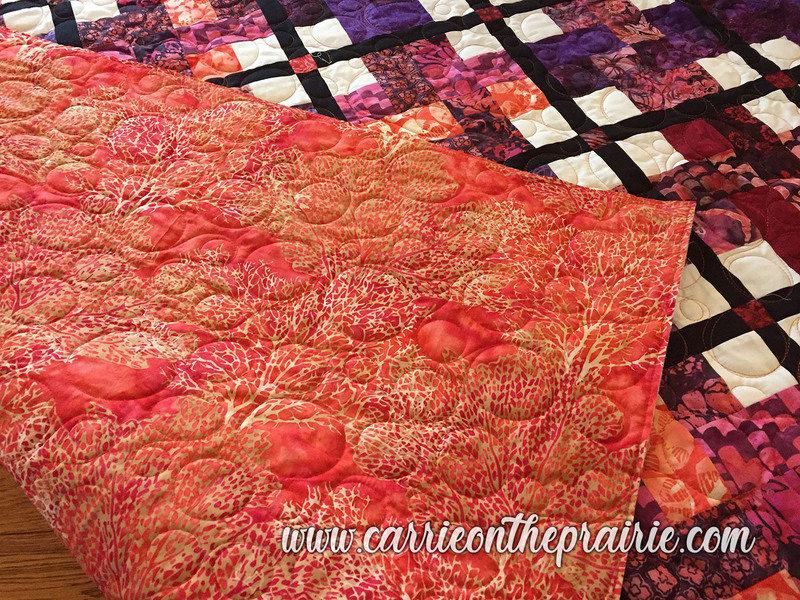 You can't really see it well in these photo, but many of these fabrics featured prints of apples, pears, and other natural components. 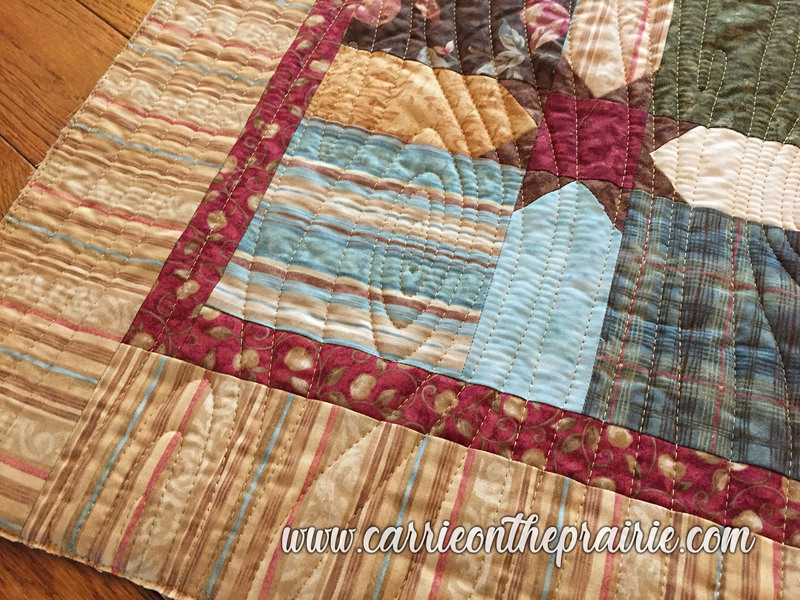 So it seemed like this edge-to-edge application of woodgrain quilting would go well with the natural feeling of this quilt. I love how it turned out! 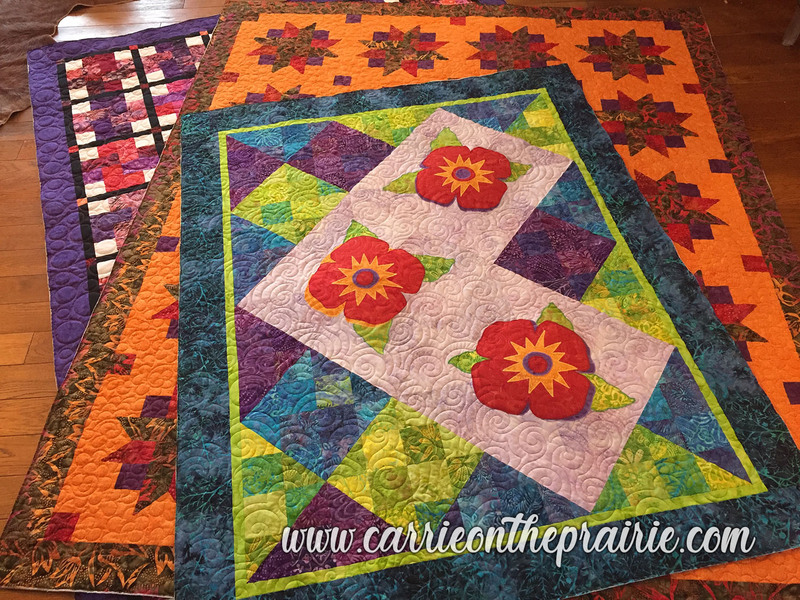 Thanks so much to Renee for bringing these quilts all the way from Washington, on her recent trip to visit family. 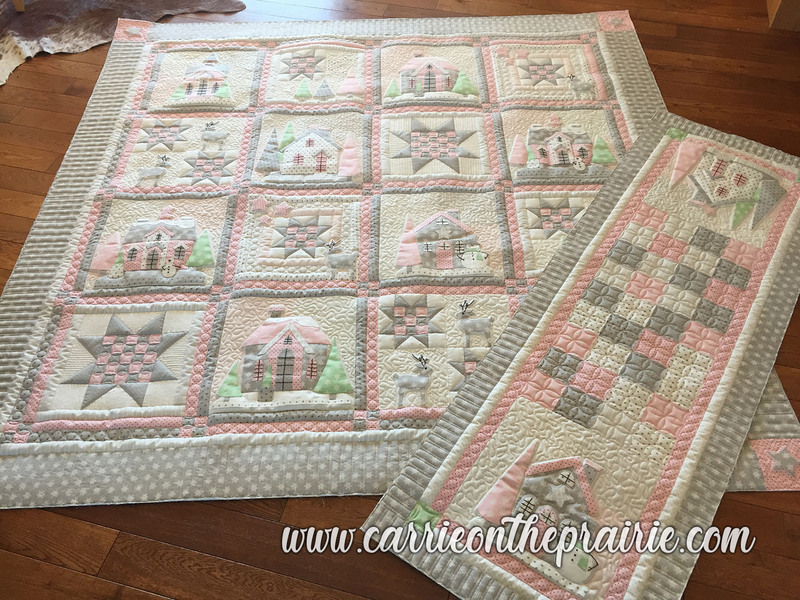 She actually brought me four, but the last one is going to come later. 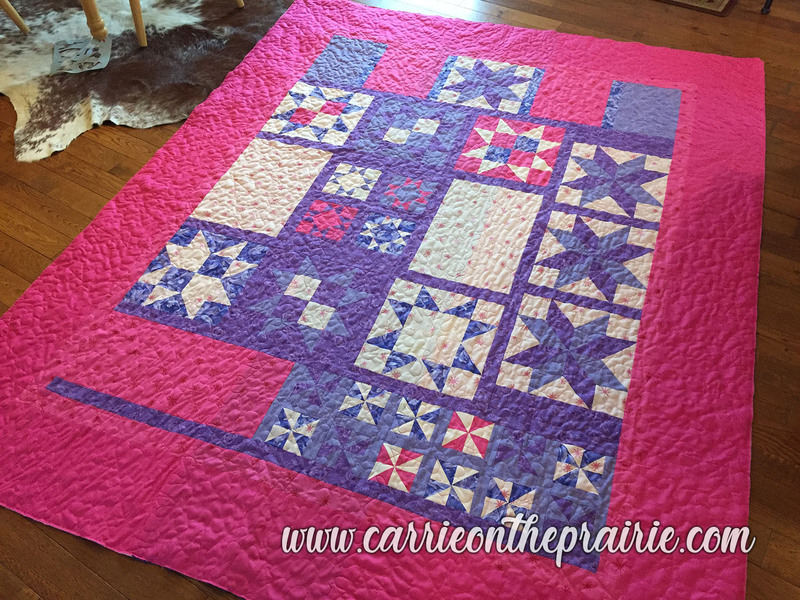 It's a special one that I wanted to take my time with. These three were more straight-forward, and I was able to apply quilting to them while she was here on her visit, so she could take them home with her. 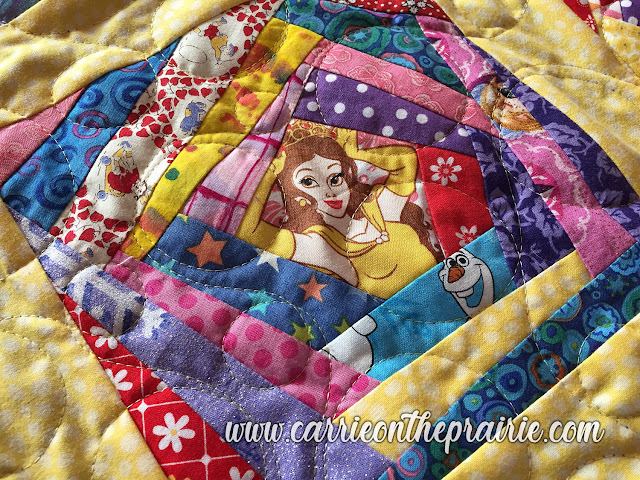 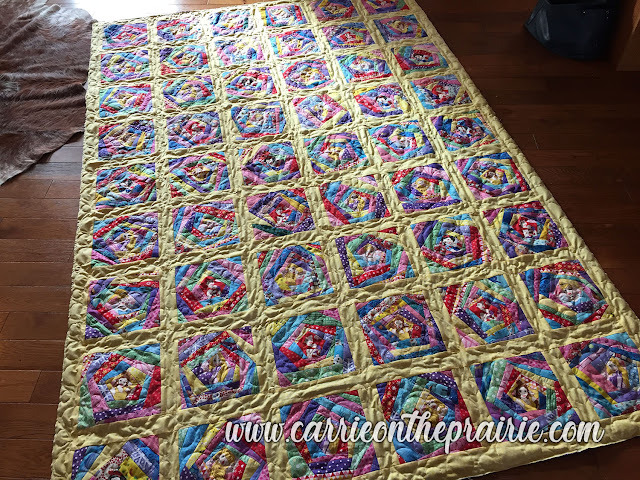 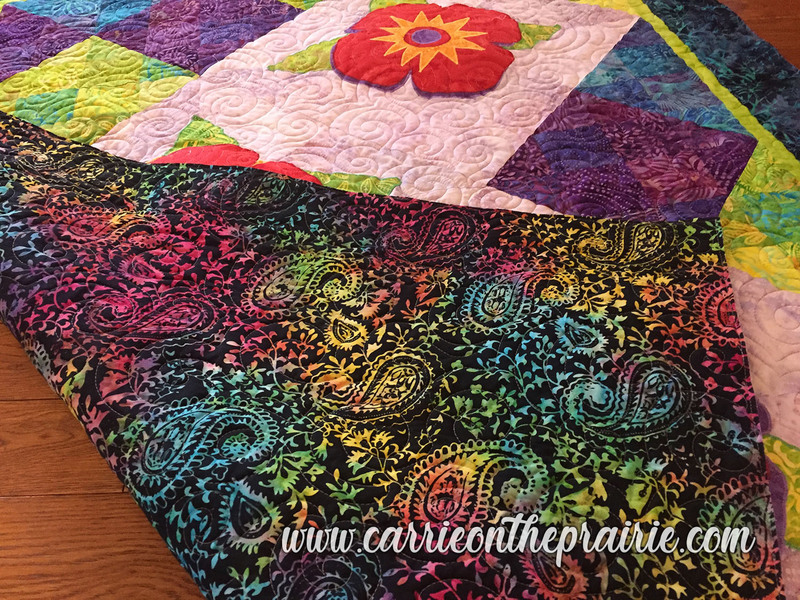 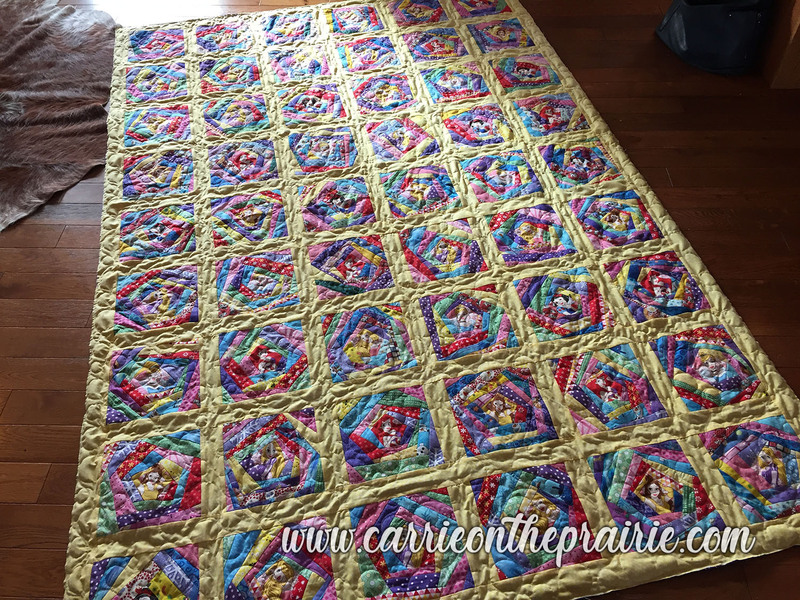 Renee's quilts are always so colorful and happy. 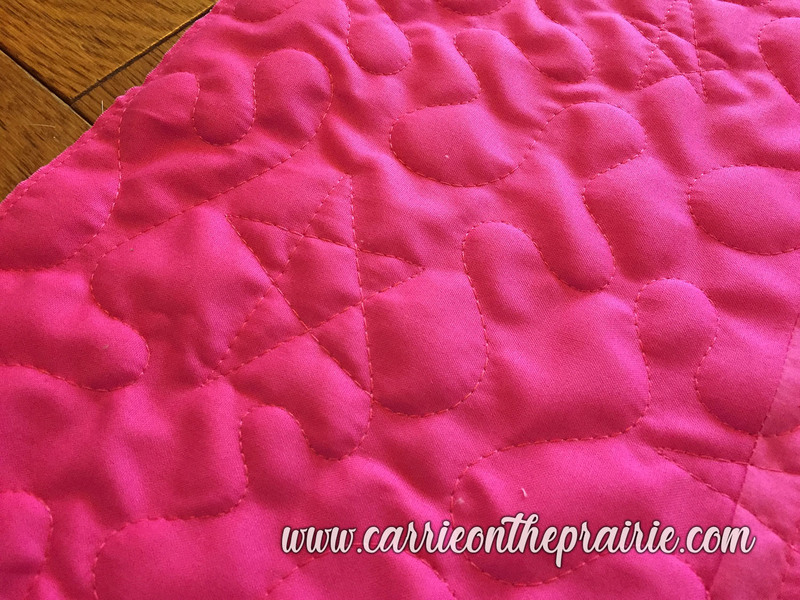 I love working on them!